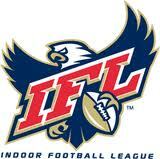 The Indoor Football League (IFL) has named WR Ramonce Taylor, DB Jesse Cooper and K Brady Beeson Vidswap.com Week 15 Players of the Week. Allen WR Ramonce Taylor has been named Vidswap.com’s Offensive Player of the Week. Lehigh Valley DB Jesse Cooper and Tri-Cities K Brady Beeson have been named Vidswap.com’s Defensive Player of the Week and Special Teams Player of the Week, respectively. IFL Offensive Player of the Week: Hot off his Week 14 Special Team Player of the Week honor, Taylor (5’11,200 Texas) scored a total of five touchdowns in the Wranglers’ 71-62 victory over the Nebraska Danger. Taylor grabbed seven passes for 116 yards and four touchdowns from the wide receiver position. Additionally, he returned six kickoffs for 135 yards and another touchdown. Taylor totaled 251 all-purpose yards against the Danger. Taylor’s 116 receiving yards and four touchdowns yards are the most any Wranglers’ receiver has caught in a single game this season. IFL Defensive Player of the Week: Despite the loss to the Green Bay Blizzard, Lehigh Valley DB Jesse Cooper (5’8,180, Bloomsburg) had a dominant defensive performance. Cooper nabbed three interceptions in the first half alone vs. the Blizzard. In addition,Cooper and the rest of the Steelhawk’s defensive backfield held the Blizzard to just 46 total passing yards. Cooper also made a significant impact on special teams as he four kickoffs for 100 yards and TD. Cooper is the first Steelhawk to win Defensive Player of the Week this season and is currently tied for the Steelhawk lead in interceptions this season with 7. IFL Special Teams Player of the Week: In his first ever game as a member of the Fever Beeson (6’0,210,St. Thomas) came through in the clutch as he hit the game winning FG in overtime to defeat the Colorado Ice 52-49. Beeson made four field goals throughout the game of 22, 45 and 49 yards as well as the game-winning 24 field goal. He was also four of six on extra point attempts. Beeson finished the game with 16 total points.